A tree symbolizes strength, sturdiness, family history, growth, connectivity, and resilience. Trees have been a part of human tradition for centuries and several military-connected children’s writers and illustrators use the tree symbol to help kids feel like they are part of something bigger, a connection to something hopeful. Because of children’s books like The Wishing Tree, The Soldier’s Tree, and Our Heroes’ Tree, a forest of military hope and tribute has begun to sprout. The children and families for whom these books were written now have a tangible place to hang their hopes, dreams, and memories. The Wishing Tree author Mary Redman is retired Navy and her husband, also Navy, was deployed multiple times when their children were young. Moved by the struggles of military families who had to endure longer deployments than they had been asked to do, Mary says, “I kept thinking about those kids. I thought the kids whose parents were on these really long deployments could use something positive to think about, instead of just missing their loved one all the time.” She wanted to offer the kids something tangible and hopeful. The idea for the wishing tree came to Mary when she remembered a tradition she had observed while living in Japan. The Japanese tie wishes to a string and, while researching more about these “hope strings,” Mary came across the idea of a wishing tree. “The hardest part when my husband was gone was keeping him in the front of my head. It was painful to think about missing him,” Mary says. The wishing tree is a way to encourage positive thoughts about a deployed loved one in the form of wishes that can be tied to a tree with yellow ribbons. The book tracks the story of a young girl who turns a barren tree into a blooming, yellow bush of hope. Christina Rodriguez illustrated The Wishing Tree, and through that book she captures the emotion of departure, waiting, and reunion for a little girl whose father is deployed. Christina tapped into her own experiences as a child when she had lived through times of separation from her military father. A young girl adds her wish to a paper tree at a reunion workshop in Vicenza, Italy, after reading The Wishing Tree by Mary Redman. 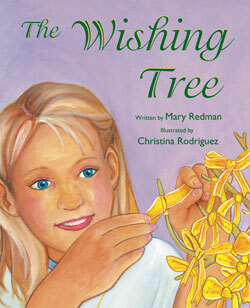 The wishing tree is a prop that Christina uses when she presents the book to classes of kids. 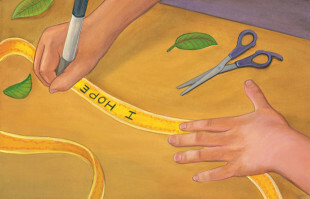 She brings in a barren tree and she encourages the kids to make their mark on a ribbon and place it on the tree. It is an exercise in connection that creates a powerful, tangible image for the children. 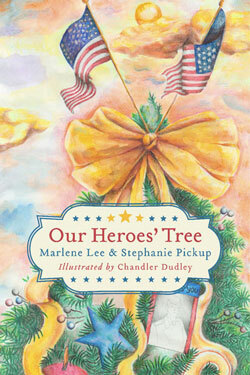 Stephanie Pickup, was similarly motivated by military kids when she wrote The Soldier’s Tree. “I couldn’t sleep because I was so worried about the families,” Stephanie says of the National Guard families under the direction of her military husband. Stephanie’s husband, a United States Military Academy graduate with two deployments, transitioned from Active Duty to the National Guard. He and Stephanie were expecting their third child when his National Guard unit was deployed after 9/11, and he became the Rear Detachment (“Rear-D”) Commander stateside. Initially, Stephanie thought it would be an easier assignment on their family, but it turned out that supporting the families of newly-deployed National Guard was difficult, too. Because of the post-9/11 deployment demands on the National Guard, civilian families were thrust into a military lifestyle. Deployments for the National Guard were longer than they had been prior to 9/11, and Stephanie recognized that many of those families were unprepared for the change in lifestyle. At the time, Stephanie could not find books for those families who were looking for stories about long deployments or missing a loved one over the holidays. Thus began her brainstorming about a story that could provide tangible hope. “Families didn’t have the literary resources to help them understand deployment. Some of our families really struggled,” Stephanie says. During her husband’s previous deployments, Stephanie and her children had packed and mailed a Christmas tree and decorations to him. Thinking about the comfort that activity had provided for her family, she became inspired to write The Soldier’s Tree as a hopeful offering to other families who were going through difficult deployments for the first time. Not long after The Soldier’s Tree was published, Stephanie was contacted by another author interested in supporting military-connected children through books. Marlene Lee is the author of The Hero in My Pocket, a book designed to give children a voice in their grief over the death of a loved one who served in the military. Marlene was inspired to write the book because of the courage of the families she met while she served as a Red Cross volunteer at Walter Reed Army Medical Center, especially the courage of a young mother of two children who became a widow the night Marlene met her. While pursuing her Masters in Thanatology and writing the book, Marlene remained motivated by the families she met as a volunteer; she continually thought about the two children in the family who had suffered the loss of their father. After The Hero in My Pocket was published, Marlene began reaching out to other military-themed authors. When Marlene and Stephanie connected, the two authors discovered their shared passion for helping military families embrace and celebrate their loved ones in the military, including those who had given the ultimate sacrifice. “We asked ourselves, ‘What more can we do to help military families?’” says Stephanie. What has grown out of their shared passion for helping is an international program called Our Heroes’ Tree. Choosing the tree as their symbol of tribute, and blending concepts from each of their books, Stephanie and Marlene designed Our Heroes’ Tree program to help communities bring together military members, families, and civilians to celebrate and honor the lives and sacrifices of those in the military. The program was officially established in 2005, starting with one tree at West Point Elementary School. The intent was to support deployed families so they would have a place to gather and honor their loved ones. The program has now grown to include all military-connected families, past and present, with programs held in thirty-four states and ten different countries. When choosing the name for the program, Marlene and Stephanie spent time considering the implication of each word: Our for all of us, Heroes for all of them, and a Tree for all it symbolizes. Veterans, active military, spouses, children, parents, and civilians are encouraged to come together around a tree and decorate it with meaningful tributes to the service members who serve or who have served. In addition, Marlene and Stephanie publish a free planning guide annually to help people easily coordinate Our Heroes’ Tree programs. And this year, they published Our Heroes’ Tree, an e-book, in response to requests from program participants. With the program well-established and the words, in the form of a poem, filling the pages of a children’s book, Stephanie and Marlene knew they needed heartfelt artwork to capture the essence of the program. When Stephanie saw Chandler Dudley’s artwork, Stephanie knew that Chandler, even though she was a high school student, would be a perfect fit as an illustrator for the book. Chandler is the daughter of U.S. Army Captain Ransom (Randy) Dudley who lost his battle with cancer when Chandler was just nine years old. She had already lived the life of a military child with separations, moves, and deployments, and her deep understanding of the military child’s life adds to her emotional artwork. Her illustrations were a good match for Our Heroes’ Tree. 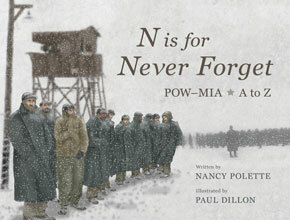 Staying connected to the program’s roots, Marlene returned to West Point Elementary with the first artistic renderings for the book. A second grade class then voted on the cover they would eventually use. Whether the trees that grow are children’s yellow wishing trees, or soldiers’ holiday trees, or the trees around which we all gather to celebrate our heroes, we each have the power to plant them. Presented in the pages of children’s books and encouraged to become living, breathing tributes, the limbs of the trees honoring the military carry words and wishes, photos, and children’s artwork. They are filled with faces, flags, ribbons, or memories, but no matter what decorations fill the branches of trees meant to honor members of the military, one thing that hangs there for sure…is love. Featured photo: Illustration by Christina Rodriguez from p. 14-15 of The Wishing Tree by Mary Redman. Inset photo: Courtesy of Karen Pavlicin-Fragnito from her reunion workshop in Vicenza, Italy. 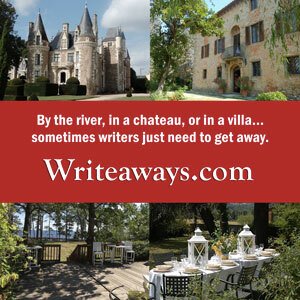 Meagan Frank is senior writer of Books Make a Difference. Military families shouldn’t miss The Impossible Patriotism Project, either. FABULOUS book for kids with deployed parents.